Those who hold a Chase Ultimate Rewards-earning credit card know the value of these precious rewards points. The flexibility to transfer the points to partner hotel and airline loyalty programs allows you to book free hotel nights and airline award tickets. However, you can also redeem points to book travel directly on the Chase Ultimate Rewards travel portal. There are several travel redemption options available including booking hotels, cruises, rental cars, and activities, however, one redemption you should consider for your Chase Ultimate Rewards points (UR points) is to book your flights on the Chase travel portal. Here’s why. The design and functionality of the Ultimate Rewards travel portal is simple which makes it easy to redeem your points. While you will not see the scores of unlimited flight choices you’d find with other flight search engines, there are plenty of options from which to select. Once you’ve booked your flight, you can return to the portal to easily manage your reservation. While it’s easy to book your own flights on the Chase travel portal, you can also redeem your Chase Ultimate Rewards points to book flights for your family, friends or other travelers. Note, however, that because the travel is being booked from your account, you’ll be the one who receives the flight notices and confirmations. When you use your Chase Ultimate Reward points to purchase an airline ticket on the Chase travel portal, it’s like using cash. You’re not purchasing a mileage award ticket therefore you’ll be earning frequent flier miles when you complete your trip. The amount of miles you earn varies depending on the airline’s specific rules regarding fare class and the cost of your ticket. Be sure to include your frequent flier account number on your reservation. You can book flights even if you lack a sufficient amount of Chase Ultimate Rewards points in your account to cover the cost of the ticket. Even if you have plenty of points in your account but don’t want to redeem a large amount, you have the flexibility to use a combination of points and paying the balance with your Chase credit card. For example, to purchase a ticket that is $324.09, you might use your total account balance of 6,238 UR points at a value of $77.98 and pay the $246.11 difference with your Chase credit card. Or you could just choose to use perhaps $50 worth of your UR points and pay the balance with your Chase credit card. There are occasions when the exact flights you want don’t appear in the flight search results on the Chase UR travel portal. 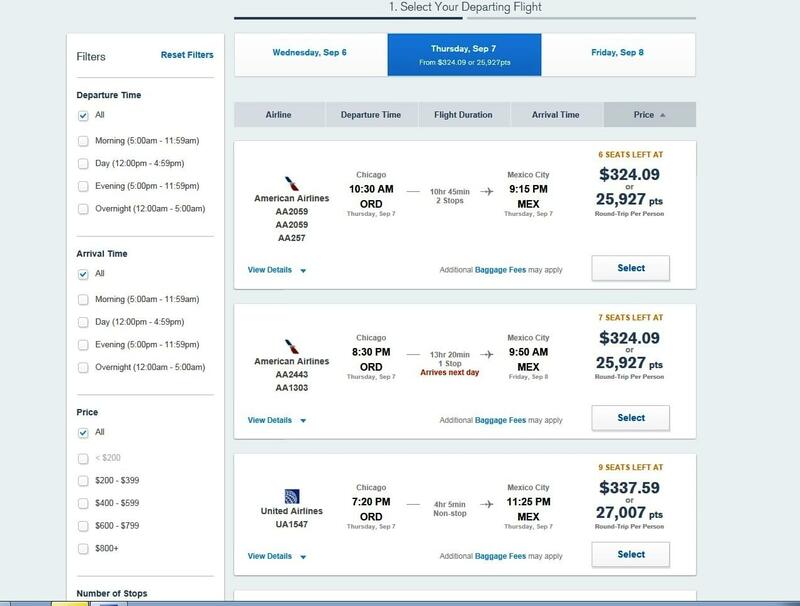 You may have found a flight on another site for instance and have tried to match the itinerary and pricing on the Chase UR travel portal unsuccessfully. If this is the case, you can call a UR travel associate and they will attempt to duplicate your exact itinerary and pricing. They’re available 24 hours a day, 365 days a year. Have more than one Chase credit card that earns Ultimate Rewards points? You can pool your balances prior to booking travel and use the account you prefer to redeem points for your flight. When redeeming points via a Chase premium credit card such as the Chase Sapphire Preferred® Card or a Chase Ink credit card, your points go a long way. For example, a $1,000 airline ticket can be purchased for 80,000 Chase Ultimate Rewards points. This translates to a redemption value of 1.25 cents per UR point. Chase credit cards with no annual fees such as the Chase Freedom® also earn Ultimate Rewards points but those UR points must be transferred to a premium card such as the Chase Sapphire Preferred to receive the greater value of 1.25 versus one cent per point if redeemed via the Chase Freedom. The dreaded basic economy fares offered by the airlines have many restrictions including the lack of advanced seat assignments, no upgrades or priority boarding and other limitations such as no cancellations or refunds. When you’re booking a flight with on the Chase travel portal, you’ll receive a pop up message if the fare you selected is one of these basic economy fares. The message will also list the applicable restrictions and offer the opportunity to accept the flight or to go back and choose another flight. Whether you choose to pay for the entire flight purchase on the Chase travel portal with your Chase Ultimate Rewards-earning credit card or for only a portion of it, you’ll be earning additional Ultimate Rewards points on the amount of the purchase charged to the credit card. When booking mileage award tickets with your frequent flier miles you may discover that the airline limits the number of award seats available, making it difficult to find space for an entire family on the same flights. When you redeem your Chase Ultimate Rewards points for flights, this is not an issue as there are no blackout dates or limited seat availability. There are situations where you would not want to redeem your UR points for a flight via the travel portal. 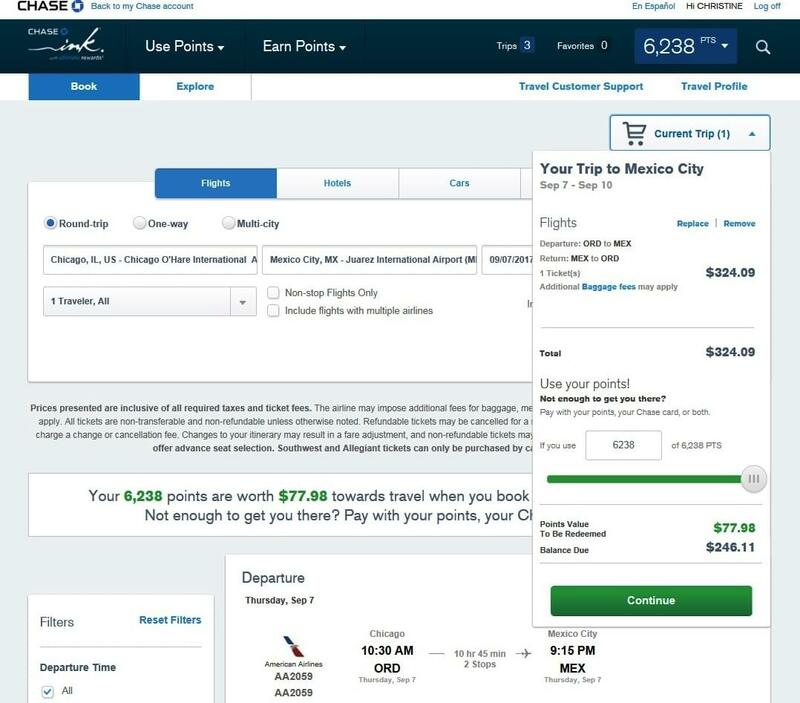 An example would be if you found a low-level award ticket on one of the transfer airline partners for the cost of 40,000 miles but the price on the Chase travel portal was $1,000. 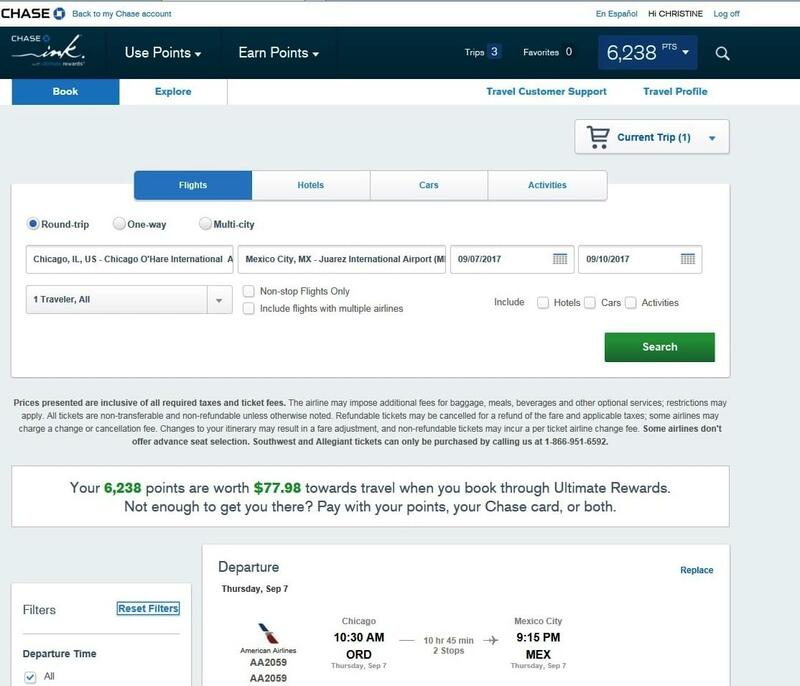 Instead of redeeming 80,000 UR points on the portal, it would make sense in this case to transfer the lower amount of UR points into the miles of the frequent flyer program and then redeem for the ticket. However, always explore both options and when the flight you want is available for the right price, redeeming your Ultimate Rewards points can be easy and a good value.